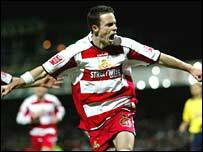 Doncaster deservedly reached the Carling Cup quarter-finals after dumping Villa out of the competition. Man-of-the-match Michael McIndoe gave Doncaster a first-half lead with a calmly taken penalty following Liam Ridgewell's handball. Early in the second-half Paul Heffernan added another, sidefooting in after he picked up Lewis Guy's pass. Sean Thornton heaped further misery on a lacklustre Villa, his deflected shot rippling into the top corner. Doncaster had knocked out Manchester City in the second round, though they had needed penalties to do so. Such was the quality of Doncaster's play against Villa that scenario was never on the cards. Indeed so assured were Dave Penney's side they looked more like a Premier League side than their embarrassed visitors. Villa's chief tormentor was left-winger McIndoe, whose jinking runs and crossing ability constantly troubled their defence. It was a McIndoe pass that freed Dave Mulligan, his low cross drawing the game's first save as Thomas Sorensen clutched the ball. McIndoe then had a shot of his own - an effort that went narrowly wide - after he was released by Heffernan's astute pass. Fittingly given his impressive start it was McIndoe who gave Doncaster the lead after Ridgewell was adjudged to have handled the ball in the area following a James Coppinger's cross. McIndoe held his nerve to slot the ball into the corner of the net as Sorensen dived the wrong way. Just past the hour McIndoe's wonderful shot - hit with the outside of boot - narrowly went wide as the Doncaster winger continued to bewitch the Villa defence. If Villa were left chasing McIndoe's shadow they also never really got to grips with Heffernan's partnership with Guy in attack. On 53 minutes that partnership bore fruit as Lewis and Heffernan linked superbly. Lewis delicately touched a Mulligan pass into Heffernan's path and this time the Doncaster striker made no mistake, sidefooting past Sorensen. Thornton was another prodigious influence for Doncaster in midfield and he capped a fine performance by scoring their third goal. With 12 minutes to go the former Sunderland midfielder skipped over a couple of Villa tackles, before his powerful shot took a deflection off the hapless Ridgewell to arc over Sorensen. If Villa's defending left something to be desired, their attack was even less effective, so much so that Dino Seremet did not have a save to make in the game. After Doncaster's first goal Gareth Barry went close for the visitors with a backward header and a driven shot. Mulligan almost diverted that Barry shot into his own net as he tried to clear and he was mightily relieved when the ball was gathered up by Seremet. Just before the interval James Milner went desperately close for Villa when his curling shot almost found the top corner of the net. Milan Baros claimed a penalty after he was upended by Steve Foster, but the Czech Republic's plea was ignored. "It was a great goal for Sean and he is looking much brighter and sharper these days and long may that continue. "It is fantastic for us to get into the last eight." "It doesn't get anywhere near when we got back in the Football League but it is up there. "We caused them a lot of problems, we stopped them playing and we passed it well and to keep a clean sheet against a Premiership side is excellent." "I thought big decisions went for them which influenced the game. "The second goal was a poor goal on our behalf and an important goal - it was important for us to get the next goal after the interval. "Good luck to Doncaster, they're a good footballing side and try to play football. They've beaten Manchester City and ourselves. "In the second half they were better than us. We came here not with a patched up side but to win and do well. We've got to move on and start climbing the league." Doncaster: Seremet, Fenton, Stephen Roberts, Foster, Mulligan, Coppinger, Thornton, Ravenhill, McIndoe, Guy (Green 87), Heffernan. Subs Not Used: Budtz, Fortune-West, Oji, Neil Roberts. Goals: McIndoe 20 pen, Heffernan 53, Thornton 79. Aston Villa: Sorensen, Hughes, Mellberg, Ridgewell, Samuel (Phillips 59), Milner, McCann, Davis, Barry, Angel, Baros. Subs Not Used: Hendrie, Taylor, De la Cruz, Moore.